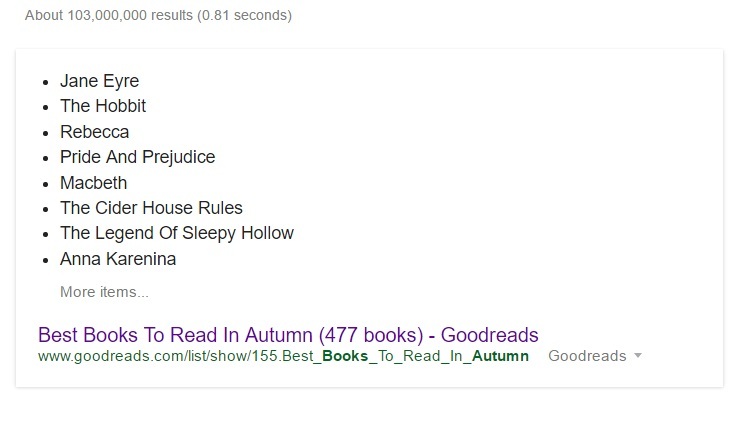 Searching for inspiration or a clever idea to use in this post, I idly googled "books to read in autumn". I'm not sure what I was expecting, but the crafty search engine seemed to have anticipated my frame of my mind and came up with an automated list that's quite fitting and brings up memories from many fall seasons and places. Here's a screenshot of the Google oracle. It's not that hard to scent it, isn't it? Jane Eyre (Charlotte Brontë, 1847). How many times have I read this early Victorian Gothic novel? How many of its film and television adaptations have I watched*? It's always dark, o course, there are horses, dogs, Jane's favorite hiding spot outside, wildflowers, Mr. Rochester's cigar. Oh, and a madwoman locked in the attic. What will happen if I layer vintage Tabac Blond (Caron), vintage Cuir de Russie (Chanel), and a good dollop of Mandy Aftel's Bergamoss? I guess I'm the real madwoman. *My favorite is the 1973 BBC miniseries. The Hobbit (J. R. R. Tolkien, 1937). Long before Peter Jackson greedily butchered the story, there were earthy hobbits and dwarves, a fire-breathing dragon, and a wizard who probably hasn't bathed properly in a while. At first I was thinkin about all the patchouli and smoke I could find, but the newest Slumberhouse perfume, New Sibet, is animalic, warm, and has a weird ash note. Rebecca ( Daphne du Maurier, 1938). "Last night I dreamt I went to Manderley again." . These words are enough to make my heart beat faster. What would one wear to the costume ball in the great mansion? The firs Mrs. De Winter wore lipstick and smelled of white azaleas. The estate itself must get whiffs of sea air and salt. I'm tempted to layer half the inventory f a Jo Malone boutique, starting with Wood Sage & Sea Salt, Wild Bluebell, Vintage Gardenia, and Peony & Blush Suede. Then I'll have to add a drop of some vintage extrait from the 1920s, when the events of the book take place. What's better than the 1924 My Sin? Pride & Prejudice (Jane Austen, 1813). It is a truth universally acknowledged, that one doesn't need an excuse to reread Pride & Prejudice. I can't find any mentions of scents and smells in the novel, but you know that smelling salts, English lavender, green meadows, and a wild flower Elizabeth may have picked while strolling are all there. Eau de Lavande by Annick Goutal, Penhaligon's Sartorial for Mr. Darcy, and Penhaligon's classic Bluebell can all work. Macbeth ( William Shakespeare, circa 1606). There's a lot more than that in the Bard's work, and personally I'd rather smell the three witches and their brew. However, "Here’s the smell of the blood still. All the perfumes of Arabia will not sweeten this little hand" is all I can think about. Secretions Magnifiques (CSI Newark, according to my scent twin) is exactly that. Layer it with any Middle Eastern style sweet perfumes at your own risk. The Cider House Rules (John Irving, 1985). remember reading it for the first time not long after the book was published, which means that I was a teenager. Maybe that's why the gut-wrenching memory is still so vivid to me. An apple orchard and the coast of Maine can be brought to life by two CB I Hate Perfume scents: Gathering Apples and Under the Arbor. The Legend of Sleepy Hollow (Washington Irving, 1820). The Blond and I visited the real Sleepy Hollow cemetery and historic Tarrytown during the first fall after we moved here. The scents of the season, the colors, the pumpkins, the crisp fall air , they all defined this area for me ever since. There's the very obvious choice of Etat Libre d'Orange Like This, but also layering of Lutens' Rousse, Louve, and Clair de Musc or Un Bois Vanille for the brave. Anna Karenina (Leo Tolstoy 1878). This is another one that puts a boulder in the pit of my stomach. I wish I could read this novel in Russian to get a better taste of it, which brings me to the smell of my mother's beautiful old edition of all Tolstoy's writing. But more than old books, there were the marshes, the snow, horses, lavish dinners, fur coats, smoke, and leather. Maybe if I piled all the Russian leather perfumes in existence, CB's In The Library, and Arquiste's Aleksandr (as it happens, Pushkin is my mother's favorite), I can get close enough. Then I'll just go and cry for poor Anna. It's your turn: what do you consider a good reading for fall? Is there a scent that connect with it? For other takes on fall and its scents please visit my friends at Bois de Jasmin, Grain de Musc, Now Smell This, and Perfume Posse. Wizard of Earthsea, Crime and Punishment, Something Wicked This Way Comes. Just re-read all three and felt the chill in the air all the way from down here in Miami. My sympathy was always with Rebecca. 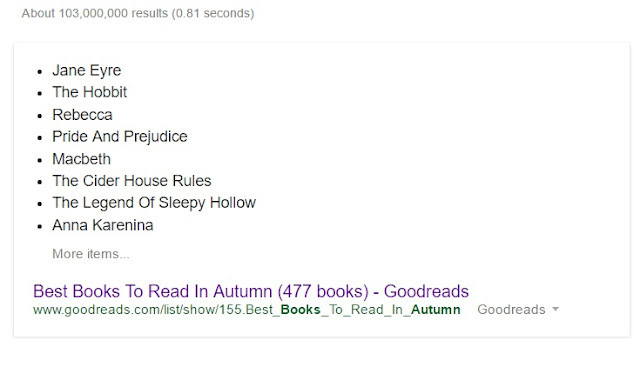 Now that is a book list I have down except for The Cider House Rules which I have never read. My favorite Jane Eyre is from the BBC but in 1983, yep I have a soft spot for Timothy Dalton. All my books are good reading at any time of the year, although maybe I'll pull the spookier ones out for this month...maybe with some cozy, warm fragrances. If you loved reading Rebecca, you must read Rebecca's Tale by Sally Beauman. 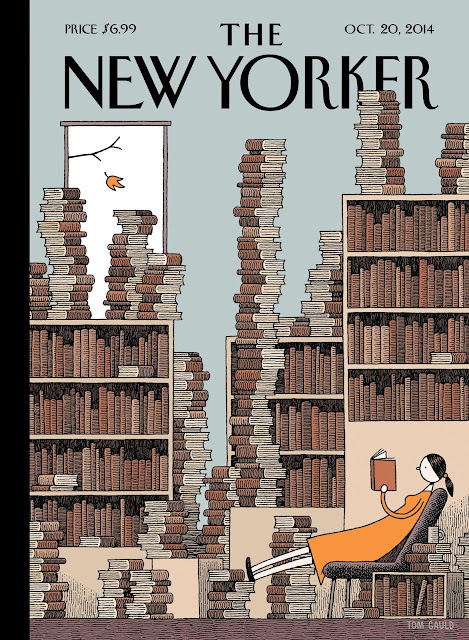 I can't even conceive of fall (or winter) without a stack of books. And I don't remember a fall where I haven't reread a Bronte or Austen. Happy sigh. I think I'd go vintage Guerlain or Caron for them. Or maybe L'Origan or Ecusson. This fall I'm starting off with rereading The Pillow Book and The Tale of Genji. Vintage (very) Shiseido Zen and Mandy's Cassis and Pink Lotus are my choices for them - infinitely grateful that she continues to provide them via special order. And Moominvalley in November and Moominland Midwinter are always essential staples for the fall and winter to pick up periodically just to make me smile. For them a vanilla scent would be my choice. No sophisticated vanillas (as in smoke, incense, etc.) need apply - just straight up, powdery vanilla. A sweet amber would also work. And I have a stack of Ngaio Marsh, Ellis Peters and Dorothy Sayers mysteries to reread. I always love classic mysteries, but especially in the fall. Fall is my time for reconnecting with much loved classics of all sorts. For the mysteries I'd choose a modern scent with dominant smoke or incense or a vintage like My Sin or Caron's Poivre. Also find myself rereading Basho and Tsvetaeva right now (for Basho alone I would love to learn Japanese - fortunately have the Russian down for Tsvetaeva). For Basho I'd choose De Profundis and for Tsvetaeva I think Mandy's new Memento Mori would work. To Anna: what translation of Basho would you recommend? I have just started Genji and love so many of the books and authors you mentioned. I've wanted to read Basho, but I can never decide on a translator. Have you come across the Felony and Mayhem press website? I suspect you'd appreciate their offerings if you don't already. As for fragrance, I'm keeping it simple this season--go to bed with a little Youth Dew and some Like This when I want something officially autumnal. Yes, I do know and love Felony & Mayhem, but my heart is still broken that Topkis had to close Partners and Crime (her brick and mortar in the Village) a few years ago. It used to be one of my first stops whenever I would go to NY - just such pure joy to be able to browse in a bookstore like that. I think it's actually remarkably difficult to capture Basho's genius in translation, which is why I would so love to be able to read Japanese, but both of David Landis Barnhill's books on Basho are favorites of mine. I also would highly recommend Makoto Ueda's Basho and His Interpreters, which offers truly invaluable commentary and both literal and literary translations. Enjoy! Thank you so much. I really appreciate your response. My sympathies on Partners and Crime; I witnessed the demise of yet another brick and mortar some months back. Also,just today, I started on Hesketh Pearson's biography of Sydney Smith that was put out by the now-defunct Akadine Press/Common Reader Catalog. I regret I didn't horde all their catalogs. Lately, it seems like being a book lover means remembering gone-too-soon entities. However,blogs like this one and kind responses like yours make me feel better. Thank you so much. I'm sure I will enjoy them! I've read Jane Eyre more times than I can count, going back to childhood. A couple of years ago I worked my way through most of the Bronte sisters' oeuvre, but Jane Eyre is still my favorite. With Tolstoy, I'm a die-hard War and Peace fan, having read it several times once I discovered the translation by Richard Pevear and Larissa Volokhonsky -- before that I'd always get bogged down in the war sections. I've even been naming my pets (Dwarf Russian hamsters) after characters in the novel, since they're Russian. After not smelling a single fragrance sample that I liked for several years, I finally found one I'm enjoying. It's Vert d'Encens by Tom Ford. I mostly have access to mass-market fragrances without ordering online, and perfumes just smell really different than they did years ago, so it's hard for me to know where to start. In the eighties I wore Chanel No. 19, but now it not only doesn't smell like itself, it lasts barely an hour on my skin. Before that I wore Charlie (I was young, lol). I was never a big No. 5 fan, but I really don't care for the new version, which fades to near-nothingness on me in a couple of hours. I guess I need to look in green, unisex, and men's fragrances. Even TF Vert des Bois fades pretty fast on me. It's thanks to TF reps at the Nordstrom beauty trend event at King of Prussia that I found Vert d'Encens, which I think I will actually purchase. Most perfumes smell too sweet and too synthetic too me, besides fading really quickly.